For years now, this gleefully gruesome musical, has made audiences scream with laughter. Seymour, a poor florists assistant, allows his craving for fame and fortune to seduce him into playing nursemaid to a man-eating plant. The show includes parodies of 60?s music and between bites, the carnivorous Audrey II brings down the house singing Rhythm and Blues a la Otis Reading or James Brown. Little Shop of Horrors?has many attractions, but the main one for me is the fact that it?s a show that doesn?t take itself seriously. This off the wall, at times anarchic musical has its tongue firmly planted in its cheek, although I did get the impression that some of the black humour was lost on the Altrincham Garrick audience on Tuesday night. For instance, the scene in which we meet the crazed dentist Orin (David Leathlean) for the first time was greeted with pockets of laughter, while I?ve been in theatres when the same scene has brought the house down. 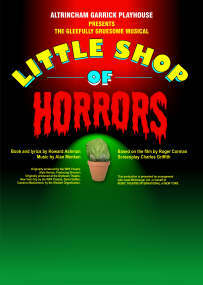 You?ll probably enjoy?Little Shop?more if you don?t know what?s coming - the geeky Seymour creates the floral equivalent of Frankenstein?s monster - but even if you do this show is still sufficiently kooky to keep you entertained. Director John Cunningham has assembled a cast who are on a mission to do just that and there are some fine performances to enjoy from Dawn Flint as Audrey, a character who is a sort of down market Marilyn Monroe type, Adam Whittle as the lovable Seymour and David Gonet as the hard boiled flower shop owner Mushnik. Laura Chandler, Stephanie Nyland and Vicki Stott sound great as the singing trio who guide us through the strange events that unfold on stage. It was pleasing to see some children in the audience on Tuesday night - why should they only set foot in the theatre only during panto season? Some of the jokes are slightly adult in nature but there?s subtle enough to go over kids heads, so there?s no need to worry on that score. Great fun - this really is a show with a difference. If it has a message, it?s probably be careful what you wish for.